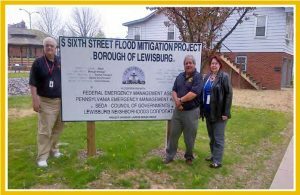 We’ve collected examples of successfully implemented natural hazard mitigation projects throughout Pennsylvania in order to assist or encourage other communities in reducing or eliminating the effects of natural disasters. Funded through public and/or private partnerships, hazard mitigation activities can ultimately save lives, minimize property damage and reduce the cost of natural disasters. Click on the map below or the list to the right to find summaries of projects near you. Do you have your own Mitigation Success Story to share? Please do so, here. To find resources for Pennsylvania residents and business owners, see the Pennsylvania Silver Jackets' Flood Risk Management Resources website here.